I recently bought a phone costing around my one month salary. It took me 1 month to decide which mobile to buy and 1 month to gather courage to buy this much expensive phone. But soon after buying phone I lost it on my way back home in local bus. Since I regularly travel in crowded bus I did not know whether I lost it or somebody stole it. I made a huge mistake by not insuring it. Had I insured my phone, I would have got almost full amount as my phone was only month old. This article is written to educate you about the benefits of mobile insurance, so you can avoid making mistake which I made. How Much money you will get? Mobile Insurance is both health as well as life insurance for your mobile phone. In case your mobile suffers from damages such as screen crack, side crack etc. or gets lost or stolen, insurer would compensate it. Though when you buy a new phone, manufacturer gives you warranty for one year which covers technical glitches but as soon as the warranty period expires you are left on your own. Most of the smartphones available in market are good enough to run smoothly for one year but technical glitches starts popping-up after one or two years. This is where the mobile insurance comes in the picture. 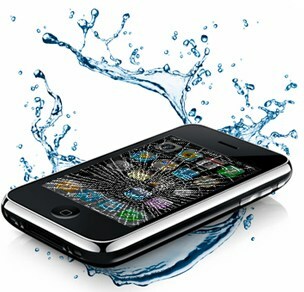 Mobile Insurance provides cover against damages, theft, and stolen etc. which is equivalent to the replacement cost of phone including all the taxes and duties. The lower the price of handset, the lower the premium you have to pay. Technical glitches including damages due to unintentional insertion of liquid fluid causes gadget to stop working. Further, there is a waiting period of 2 to 3 days that means claims will be entertained only after 2 to 3 days of registering with the insurance company. Depreciation is the biggest factor which reduces your claim by significant amount. Co-payment means a fixed amount which insured has to pay in the event of claim. Most of the mobile insurance policies have a standard clause of 5% co-payment, which has to be borne by the insured. Sometimes this may be as high as 10%. For example if you have agreed to a co-pay ratio of 5%, you will need to shell out Rs.1,500/- in case of claim of Rs.30,000/-. In case of an insured mobile phone is lost or stolen, insured needs to file police complain at the nearest police station within 48 hours of the loss of the phone. The mobile bill together with the FIR needs to be submitted to the insurer to obtain insurance claim. In any other case the mobile bill along with repairing bill shall be submitted to the insurer. Remember that repairing bill shall be of an authorized service centre only. Duly stamped and signed SIM blocking letter or email copy from Service Provider duly stamped and signed. Usually, replacement cost of the phone is given to the claimant after deducting the applicable charges and depreciation. A phone costs Rs.30,000/- including taxed and duties, if gets stolen within 3 months of purchase and still available at the same price in market than the customer would get roughly Rs.22,500/- i.e. after charging depreciation of 20% and co-payment fee of 5%. If the price of the phone is reduced to Rs.27,000/- than the claim will also get reduced by Rs.3,000/- i.e. to Rs.19,500/-. Though there are various companies offering mobile insurance plans in India but here I have listed only those companies which provides individual plans and not group insurance plans. 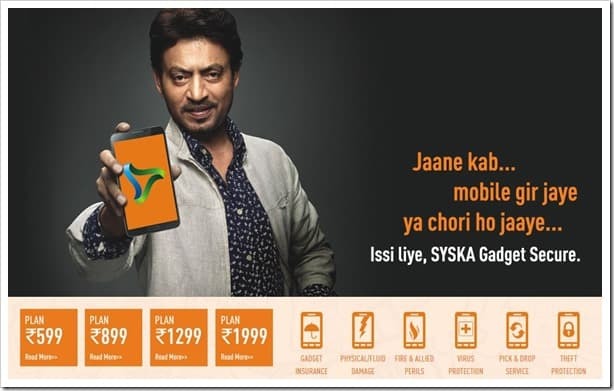 Syska is a private insurance company which recently started offering mobile insurance plans. Currently company is offering 4 plans providing cover against theft and damage. These plans are based upon the price of the handset. Company is also providing various additional features bundled with the plan such as Ant-virus protection, various games, magazines, songs and movies. Started in 2010, Onsitego is a mumbai based company providing on the site support for various gadgets such as mobile, laptop, tablet, television and digital camera but does not provide insurance against theft. As the name suggest, onsitego is specialized in onsite services which means they will pick the gadget and drop it to your doorstep after repairing. 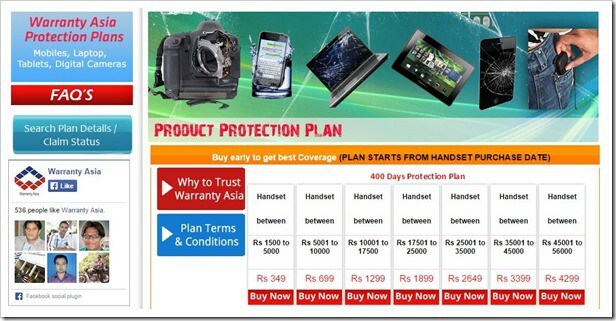 The maximum price range of the device and time period you can get extended warranty for is Rs.80,000 and 1 year. Gadget Cops is amongst the first company in India to provide complete cover for electronic gadgets, with primary focus on smartphones. 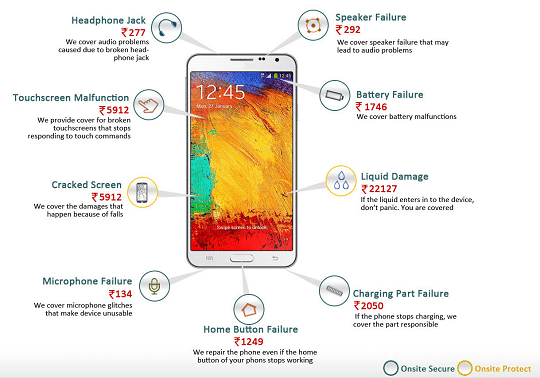 Gadget Cops provides both extended warranty as well as coverage against Accidental Damage, Liquid Damage, All Mechanical and Electrical faults. The tenure for the plan is up to 2 years. Additionally, company also provides cashless service in which customer need not to pay any charges for repairing to the authorised service, the bill will be paid by company directly. Warrantyasia protection plans cover your handset against theft and accidental damages including water logging, Screen Damage and Complete Handset breakdown for 12 months. The extended warranty of 3 months is also provided which include technical repairs. You will have to buy policy within 2 days of buying smartphone and the cost of plan is flat 10% of the invoice cost of handset. 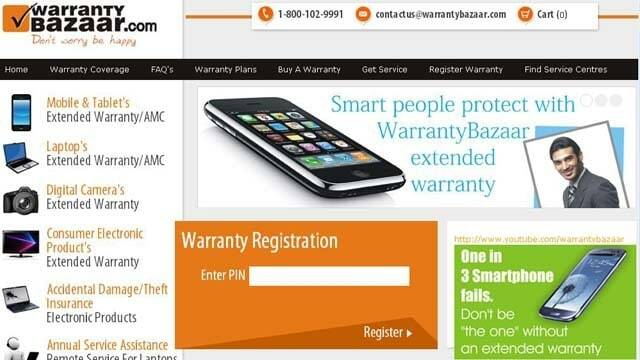 Warranty Bazaar provides a simple extended warranty plan for one year which includes coverage for mechanical and electric failures during normal use. You can claim insurance for unlimited repairs during the policy period. Insurance cannot be taken for Mobile Phone purchased from the Grey Market i.e. without bill and second hand mobile. You will have to take mobile insurance policy within 2 days to 15 days of purchasing mobile phones by providing your invoice copy. Read the fine print of the policy, majorly inclusions, exclusions, depreciation clause and co-payment clause. Disclaimer: SimpleInteres.in is not associated with any of the insurer listed above. The article is provided for education purpose and you should do full research before buying any mobile insurance policy. It was a good informative Post. I would like to mention that BigC used to give their own Mobile Insurance for 1 year with a minimal premium. I purchased a Samsung a few years ago with them for a cost of Rs 10000/- or so and the premium for 1 year was Rs 350. A very elaborated article covering everything about mobile insurance. Without any doubt, one should insure his/her phone. Since smartphones are also holding a major part of our expenditure, so in the case of any unwanted damage to the phone, you can get some monetary refund, then what’s the harm in it. At least, the total loss is compensated by a reasonable amount from the mobile insurance company. Personally, I got my phone insured from GizmoHelp. I heard about it a lot and I am very much satisfied with their plans. One can check more details from their website. You are an employee of Gizmo and writing reviews here as a customer. This shows the ethics level of this company. Hi Sanyam, please share if the data available with you that what would be the market share of Mobile Insurance industry in India ? what is the market share of Mobile Insurance Industry in India ? Is any company providing insurance for three month old phone?? It was a good informative article. I would like to mention that UniverCell used to give their own Mobile Insurance for 1 year with a minimal premium. I purchased a Nokia Phone a few years ago with them for a cost of Rs 6,000/ or so and the premium for 1 year was Rs 250. It included the theft/repairs. Not sure whether they still continue or not. It’s good idea to buy insurance by paying premium than purchasing new phone. These companies should allow insurance of old mobile phone also.